The 1966 Dayton, Ohio Uprising began on September 1, 1966 after the murder of African American Lester Mitchell by an unknown white assailant. Mitchell was sweeping the sidewalk in front of his bar at 3:00 a.m. when, according to witnesses, a red car pulled up to Mitchell and a white man shot Mitchell in the face with a shotgun. Witness accounts vary as to whether it was a single white man or a group. According to one witness, Tommy Campbell, all he saw was “the red (of the car), and the barrel of the gun… All I could tell was they were white men.” Mitchell was taken to the hospital where he later died from his wounds. Dayton was one of the most segregated cities in the United States in 1966, with 60,000 black residents crammed into a small and impoverished West Dayton neighborhood. 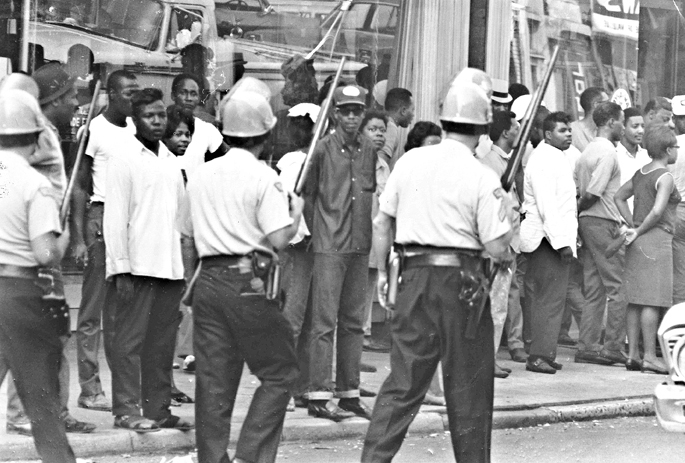 For years leading up to the uprising, black activists and community leaders complained about the issues facing Dayton’s African American community which included lack of quality education, joblessness, poor housing conditions, and lack of city services. By 10:00 a.m. looting, rioting and violence had spread throughout West Dayton. Groups of rioters threw rocks, bottles and other projectiles at buses and cars carrying or being driven by white people and, according to press reports, yelled “Kill! Kill! Kill!” A 40-year-old white truck driver was injured when a rock was thrown through his window, breaking his jaw. There were numerous injuries and more than 500 arrests. City services were briefly suspended. Trains were re-routed and police estimated property damage to be about $250,000, or $1.9 million in today’s dollars. Most of the businesses that were damaged and looted were black owned. Josh Sweigart, “Lasting Scars: The 1966 west Dayton riot,” MyDaytonDailyNews.com (August 30, 2016), http://www.mydaytondailynews.com/news/lasting-scars-part-shooting-sparked-1966-dayton-riots/3jKIHlMSeAQwMbAZqh2kQM/; “The Dayton Riot,” F-A4618, Historicfilms.com (1966), http://www.historicfilms.com/tapes/9343.